The size of each Paw Patrol Water Bottle Label is 8.5 in x 2 inches. The download has 3 Paw Patrol water bottle labels on one 8.5 x 11 sheet. 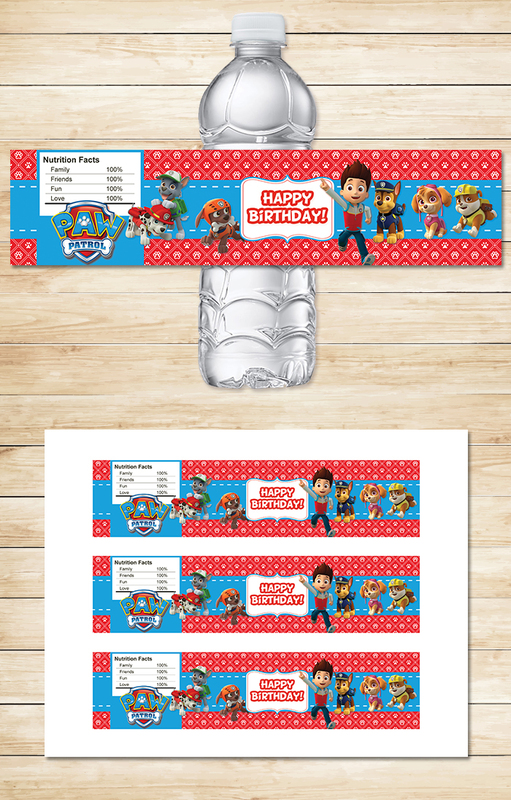 See the whole set of Paw Patrol Party Printables Red BG Theme. The link is still in correct. A correction would be great. I love all the other links. Would love the correct link to these water labels. Thank you!! What happens when you click the green button that says Download JPG. I'm unable to reproduce the error you are seeing. The candy bar PDF opens rather than the water bottle labels. Is there another link to the water bottles? The link takes me directly to the chocolate bar labels. Ok try again, the link should be fixed now.